Linh Do is a social change advocate who has been working on environmental issues for the past decade. Her background is in community organising, new media and strategy development. She is currently the Australia and Pacific lead for The Climate Reality Project, Al Gore’s climate change leadership program. Linh’s environmental advocacy has seen her work with a range of stakeholders, from high school students to the United Nations and the Reuters Foundation. She led the Australian Conservation Foundation’s community organising program and has worked with Climate Action Network International. Linh has served on both non-profit and for-profit boards, and in 2010 she co-founded the online community engagement platform, OurSay. Most recently, Linh served as publisher and editor-in-chief of newswire service, The Verb, where she worked with a global team to localise and humanise stories from the UN climate change negotiations. 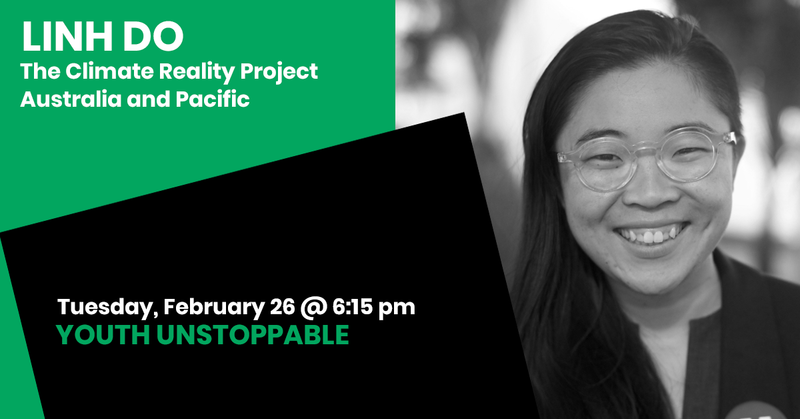 Linh is an accomplished public speaker and writer, whose work has been featured in Al Jazeera, Vogue, the Huffington Post and the Washington Post, amongst others. In 2013, Linh was named a World Economic Forum Global Shaper, Australian Geographic Young Conservationist of the Year, and one of Junior Chamber International’s Outstanding Young Persons of the World.